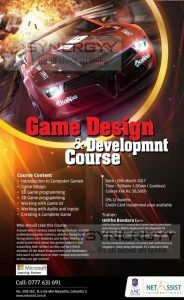 ANC invites applications for the Game Design & Development Course for the new intakes. It’s a great opportunity for those who love games and willing to develop new games. Anyone who is serious about being involved with the professional games industry, whether being hired or hiring others 16+ Students and Artists looking to understand more about the games industry and expanding their skillset so they can be critical member of the team Programmers and Developers who want to add more to their resume and portfolio so they can get noticed. Uditha Bandara is a corporate trainer and a consultant specializing in Mobile Application development for Windows Phone. Android and IOS. He was South East Asia’s First XNA/DirectX MVP (Most Valuable Professional). He has conducted sessions at events and conferences in Singapore. Hong Kong. Malaysia. Sri Lanka and India.